Dr. Claudia Perez-Tamayo, FACR, FACRO completed her radiation oncology residency at the Medical College of Wisconsin. She was awarded prestigious fellowships to both the American College of Radiology and the American College of Radiation Oncology for her contributions and service through education, research and service activities in the practice of radiation oncology. Her academic appointments include the University of Michigan and the University of Kansas Medical Center. She participated with the American College of Radiology Commission on Small and Rural Practices, was appointed to the President’s Cancer Panel and is a part of the Kansas Comprehensive Cancer Control Panel. 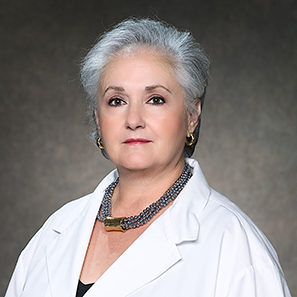 Dr. Perez-Tamayo is board certified by the American Board of Radiology and the American Board of Internal Medicine sub-specialty of Hospice and Palliative Medicine. She has expertise in both brain and body stereotactic procedures. Some of her memberships include the American Society for Therapeutic Radiology and Oncology, the American Society of Clinical Oncology, the American College of Radiation Oncology, the Kansas Medical Society, and the Kansas Society of Clinical Oncology.